Adding a contact form to your BigCommerce store is easily done with JotForm. Create a new form using one of available JotForm Templates, or manually per your own requirements using our Form Builder. 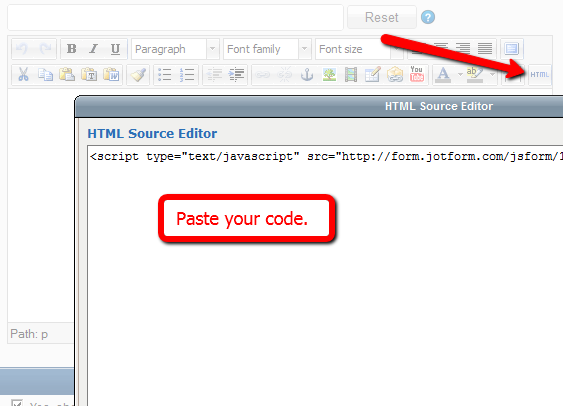 When you're done creating your form, you need to get the Embed script code and put it on your web page. Click the "Publish" button in the toolbar. In the Publish window, please go to the "Embed" tab. Choose "Embed" in the Embed Options list. Click the green "Copy Code" button. In your BigCommerce control panel, click "Create a Web Page" under "Website Content" tab. That's it! You are now using JotForm for your BigCommerce page. I have a question regarding the same. If i integrate the form in my site, how can jotform know that the submit request came from the website itself, not from any other service, for ex postman or rest client or through code. I can send multiple requests once i have the end-point of the submit form through code and change the data. I want to store some user data(preferences). BigCommerce made life easier to all, and easy creation of "Contact Us" button; is something "God given" to users that want drag-n-drop web-site or blog to make. - Easy insert of the code needed is something that made today e-commerce easy, and fast. JotForum will always keep you updated with latest needs of e-commerce users, bloggers, and all those who need features of the JotForm. Check your facebook page - your billing 'glitch' has now twice caused interruption to by departments. you are loosing my business due to this. I cant tell you how much more work it requires all of my employees and myself by having to do things manually since you cant figure out your billing system. Can I integrate it on Bigcommerce? Is it possible to create a simple ecommerce site with 4 to 5 pages using JotForm?